‘Baby it’s cold outside.’ Our crews are prepared to work in these conditions so you don’t have to! Just stay inside and enjoy the light! We save you space. Not only do we perform installation and tear-down, we tuck the lights away in labelled storage bins until next season. We have a network of distributors who offer us the best quality of professional-grade products as well as the latest trends in holiday lighting. We can get that special item you want to complete the perfect display! It goes without saying that if you injured falling off the ladder it may lead to lost time at work and more. We are well trained and fully insured so that if something was to happen you are covered. For more even more reasons why you should book holiday lighting installation this season, check out our blog here. 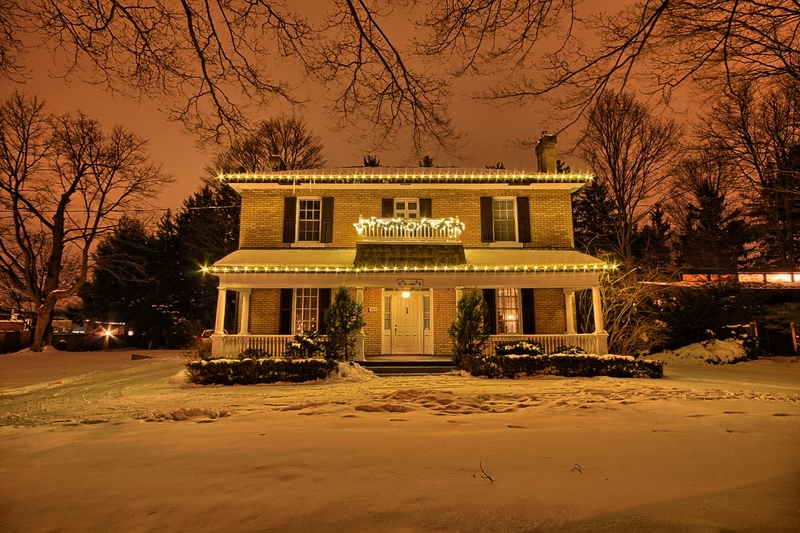 If you want to make the neighbours envious of your holiday display this season, contact us today! This entry was posted in Holiday Lighting and tagged holiday lighting, holiday outdoor lighting, moon glow holiday lighting on October 15, 2017 by moonglow. Are you looking for a way to WOW your guests this year? Have you considered lighting as part of your special event? It seems obvious that you need light to carry the party into the evening, but how much emphasis have you placed on this very important component? 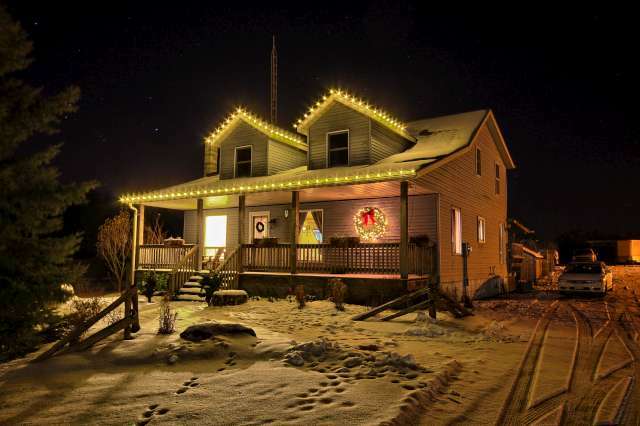 At Moon Glow, we specialize in two basic categories of lighting – landscape and holiday. Both of these formats can complement your function regardless of the time of year. Holiday lighting can extend its usefulness into the warmer months for outdoor weddings, parties and other events. A selection of trees lit with closely wrapped white strands adds a warmth and balance to the festivities. 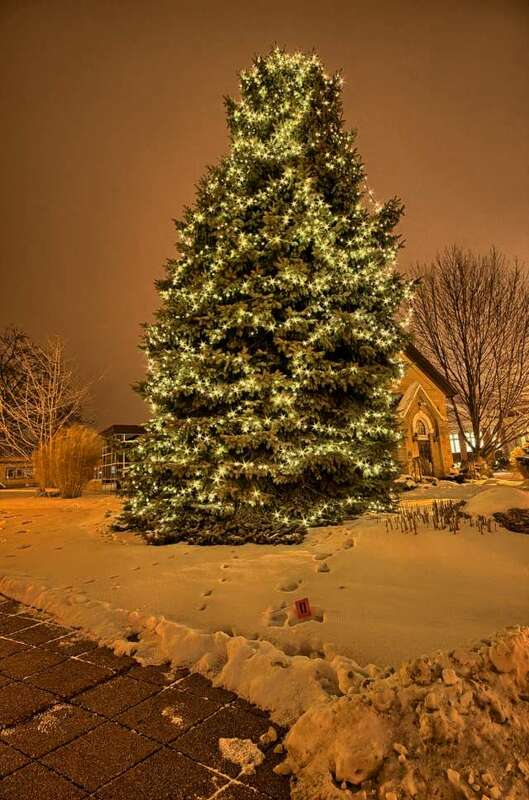 Temporary or permanent up-lighting of trees and other subjects invites your guests outside to enjoy the evening hours. Path lighting will guide your friends, family or colleagues to a wonderful night! Contact us today to bring light to your event. This entry was posted in Holiday Lighting, Landscape Lighting and tagged festive lighting, holiday lighting, landscape lighting, lighting, outdoor lighting on March 15, 2017 by moonglow. While most people spend a great deal of time decorating the interior of their homes for the holiday season, there are plenty of ways to bring that festive sparkle outside and share it with friends, family and neighbours. Check out these 10 trends that are lighting up the front porches, backyards, and landscape designs of joyous folks all over, and find some inspiration to make your outdoors more festive. You’ve seen the houses that are truly committed to this style: they have lights in the shape of popular characters blinking along to the beat of recognizable tunes. While this imaginative (and laborious) style of light decoration is certainly admirable and appreciated by many, you don’t have to make it such a dramatic event. A few blinking bulbs, placed to music or not, can help create a whimsical environment that’s eye-catching without being overwhelming. It’s easy to set up a nativity, Santa and reindeer, or Hanukkah scene on the front porch. Many stores carry pre-made characters that are easy to set up and plug in. If you’re feeling more adventurous, create your own winter wonderland with string lights, sculpture wire, and a free afternoon. If your house, porch, and landscape have a number of charming features that are ignored during the colder months, bring them out from under the blanket of snow with colourful string lights. Bird feeders, fire pits, fence posts, and lanterns can all be played up with some lights, candles, and garlands. Again, this is easy to adapt to your level of craftsmanship, but adding some friendly creatures to your front and back yard can instantly elevate a dull lawn into the perfect cozy place to enjoy a cup of cocoa on a snowy evening. For a classy look, tuck delicately lit deer and foxes into bushes and trees, where they would be if they were real. Inexpensive, fun, and lovely, it’s easy to make some colourful lanterns using water balloons, food dye, and the home freezer. Fill water balloons with dyed water and let freeze (you can leave them to freeze outdoors if it’s chilly enough). Remove the latex balloon and drill a small hole into the frozen globe. Place a candlestick or tea light inside and line the walkway paths or porch bannister with the glowing orbs. Ornaments aren’t just for indoor Christmas trees anymore. String simple, inexpensive ornaments (like homemade salt dough pieces or plastic toys) onto string and hang from window and doorframes, dangle off bare tree limbs, and suspend from chandeliers. Add a few hanging strings of light alongside them to show off the goods. In addition to ornaments, you can hang string lights vertically, rather than wrapping them around trunks and branches, to make leaf-free trees look like fountains of light. One or two trees are plenty, as this is an especially dramatic decoration. It looks great combined with a few more simple festive elements. Routinely overlooked, the mailbox is great place to add wreaths, foliage-based garlands, and colourful lights. The mailman or woman is sure to appreciate the added effort, just make sure you don’t block access to the opening. You can even add a small seasonal scene to the top if it’s flat. String lights are the most popular illumination during this time, but using candles—real or battery-operated—can add elegance and glamour to a property. Place the candles in the window, or bury them slightly in the snow near special features. You can also line walkways with them for added beauty and safety. Glowing gift boxes can make an eye-catching centerpiece for the lawn that puts the focus back on everyone’s favourite part of the season: the presents. A little different than the standard decorations, these fanciful boxes will have you standing out from the crowd. The festive spirit of the holidays should never be confined to the indoors alone; they should extend to the back and front yard where everyone in the neighbourhood can appreciate the beauty. A few lights, some homemade elements, and spare time are all that’s needed to make your landscape an appealing holiday attraction. 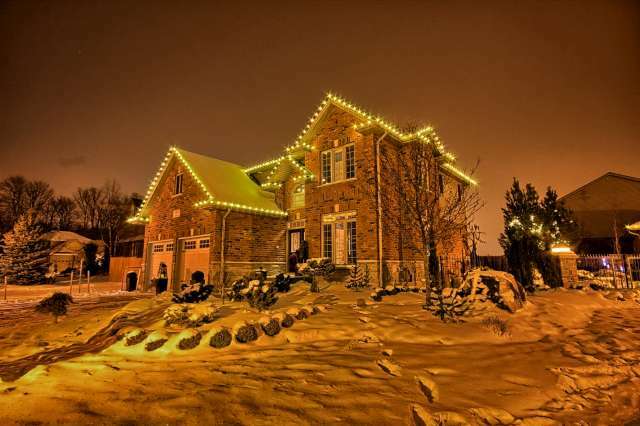 We can put together a complete, automated lighting system that will dazzle the neighbourhood this holiday season. Contact us and request a consultation today.